Sage Ranch is a Santa Monica Mountains Conservancy open space area adjacent to the Santa Susana Field Laboratory (SSFL) Superfund site. 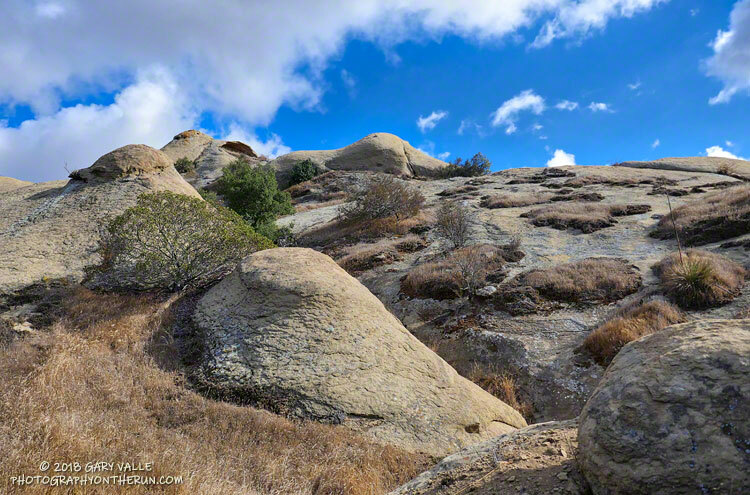 The sandstone rocks are an exposure of the Chatsworth Formation, which extends from the Simi Hills across the 118 Freeway to Rocky Peak and the Santa Susana Mountains. The popular rock climbing area Stoney Point is a well-known example of the Chatsworth Formation. Geology and climate are the foundation elements of habitat. They influence — and sometimes dictate — the plants that inhabit an area. The plant Santa Susana Tarweed is very common on exposures of Chatsworth Formation sandstone, but rare elsewhere. Exposures of Chatsworth Formation sandstone in Sage Ranch Park and Rocky Peak Park are sufficiently rugged as to create areas of isolated micro-wilderness within urban open space.